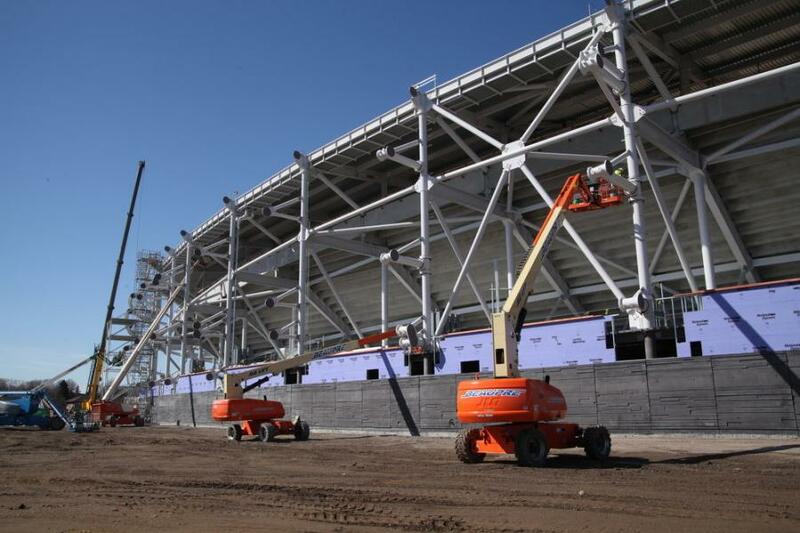 Construction crews in St. Paul, Minn., recently completed a new professional soccer stadium notable for the first-of-its-kind skin covering of its outer shell and a look unlike that of any of the other pro sports arena. 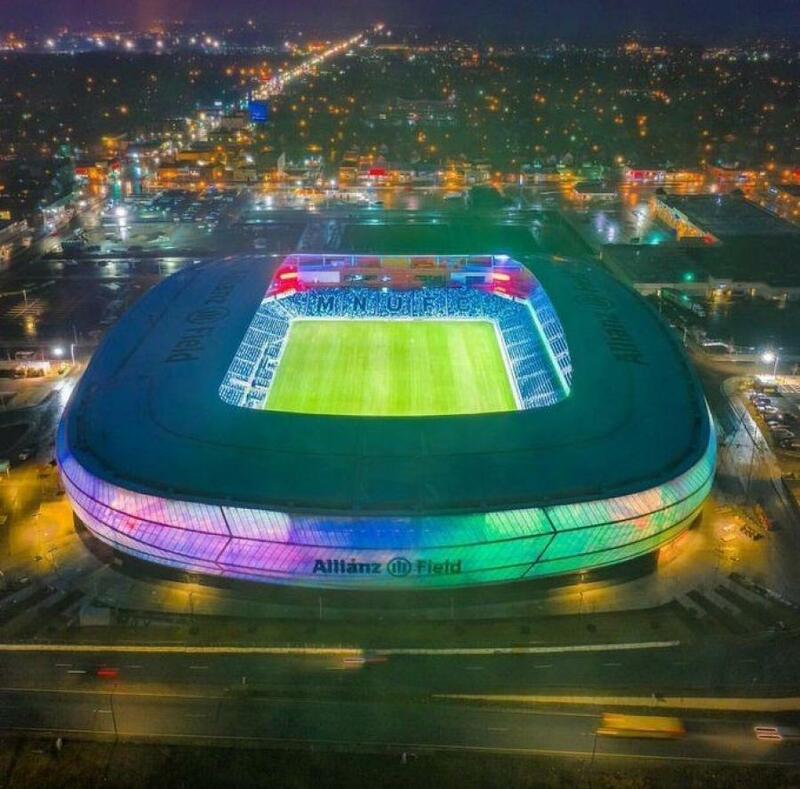 Minnesota United FC of the Major League Soccer (MLS), will play its inaugural game April 22 at the new Allianz Field which sits in the heart the neighborhood known as the Midway. 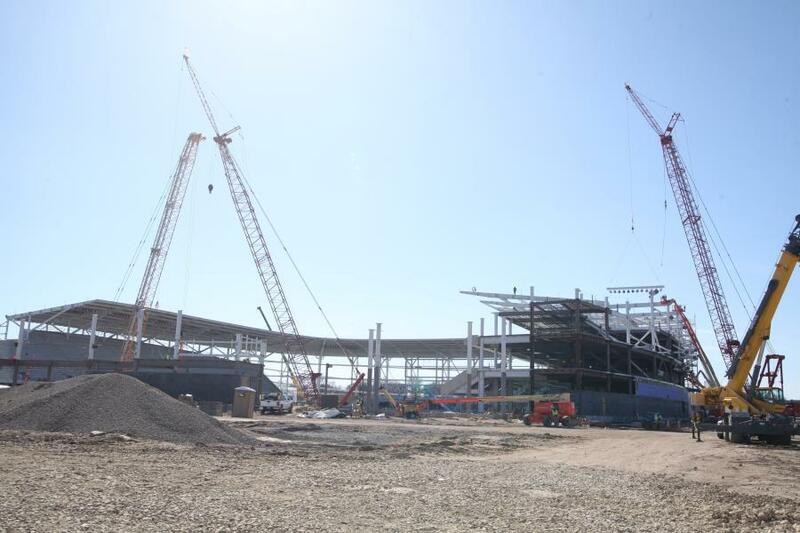 Mortenson Construction Company, the general contractor of the project, turned the keys over to the Allianz Field ownership group in late February. The company is no stranger to building major league and collegiate stadiums around the country. Three years ago, it brought to the Minnesota Vikings its glass-enclosed U.S. Bank Stadium. M. A. Mortenson founded the company in 1954, and today, it has offices throughout the United States and Canada, taking on heavy civil-industrial projects from planning and design through project management. Allianz Life Insurance Company of North America captured the naming rights for the stadium, which will anchor the 35-acre redevelopment site. The property was formerly occupied by a long-dormant Metro Transit bus yard and two other commercial properties and also is slated for future housing, as well as commercial and retail space. Scott Amundson, Mortenson site superintendent, rolled out a list of construction actions and management details that brought construction to an end on what is most likely the last major sports project to be built in the Twin Cities of St. Paul and Minneapolis. 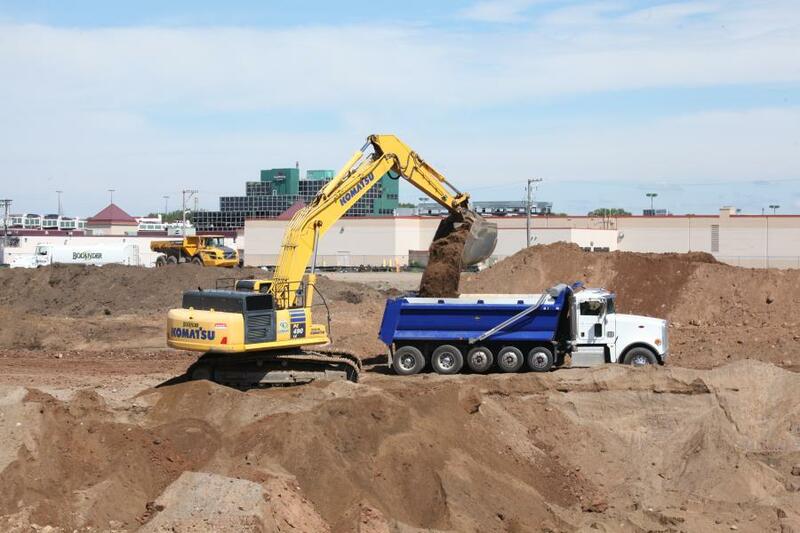 Excavation, soil remediation, building demolition, new road connections, traffic control, utility cutoffs and new utility connections were all part of the project. Soil remediation was a massive undertaking because of "the huge volume of soil that had to be documented before it left the site," Amundson said. The site is very urban. Road closures on major city arterials disrupted traffic patterns through the first year of construction and made communications to the adjacent businesses and traveling public a priority. Ongoing property transfer challenges to a section of the Midway Shopping Center, one of three properties that occupied the site, confined work to approximately three-quarters of the stadium footprint and required the resequencing of the original schedule. On the administrative side, permits from a variety of governing agencies had to be obtained. Transcending all this, though, crews successfully wrapped a fiberglass weave laminated with polytetrafluoroethylene (PTFE) material around the stadium exterior. The weave is manufactured by Fabritec, a textile company with offices around the globe specializing in this type of covering, and it is the first application of this technology in the United States. Despite the resequencing of the schedule and new building techniques, Mortenson and its team of subcontractors remained true to their time frame and completed the $200 million stadium in 22 months. Amundson acknowledged his team of subcontractors for delivering this stadium on schedule. "We had the benefit of using subcontractors that were coming from the U.S. Bank Stadium in Minneapolis, so we were able to make the most of those existing relationships," Amundson explained. "Our mechanical, electrical, structural steel and precast crews were all made up the same players, with the same foreman. That goes a long way when you have those relationships already. "The fabric guys were new to us and it took a while to get to know them," he continued. "Our team worked very closely with them to define all aspects of the fabrication, delivery, site logistics and the fabric installation. It was our most complex job, and they did a great job on the installation." Contractors working on the stadium included Bolander and Sons, St. Paul; Pete's Water and Sewer, Brooklyn Park, Minn.; Wells Concrete, Minneapolis; Danny's Construction, Shakopee, Minn.; Thomas and Sons, Rogers, Minn.; and Populous, the architects for the stadium, headquartered in Kansas City, Mo. In detail, the 346,000-sq.-ft. Allianz Field seats 19,400 soccer fans, with room for 500 more. It features 22 suites, 19 semiprivate lodge boxes, three club rooms and a brew hall that will be open year-round. As a finished product, this stadium stands out from the more angular architecture of the other six pro and collegiate stadiums in the Twin Cities. From street level, the structure has a sleek, futuristic look. The oval-shaped roof line at the main entrance gracefully dips down and rises again, guided by the tubular steel of its exoskeleton. The PTEF exterior wrap sparkles and ripples in the sunlight. At night, LED lighting will shine through the translucent skin and shimmer with color like the Northern Lights. A canopy will cover fans from above while the PTEF wrap will protect them from the elements from the side. Fans will feel a part of the play on the pitch because the closest seat is 17 ft. away, and the farthest is only 125 ft. away. Players will be running and kicking on natural sod, beneath which a hydronic field heating system made up of 27.5 mi. of pipe will maintain healthy grass cover throughout both warm and cool seasons. The site is hemmed in by high-density commercial and residential properties and surrounded by three busy arterials — Snelling Avenue, University Avenue and Pascal Street. Interstate 94, bordering the south side of the stadium, carries 100,000 vehicles past it every day and connects to Snelling Avenue, creating one of the busiest interchanges in the city. When construction began in late May 2017, the long-dormant bus barn, scattered with weeds, debris and broken-down buses, quickly sprang to life as Cat, John Deere and Komatsu excavators began scooping out the first buckets of dirt, much of it laced with petroleum-based products. 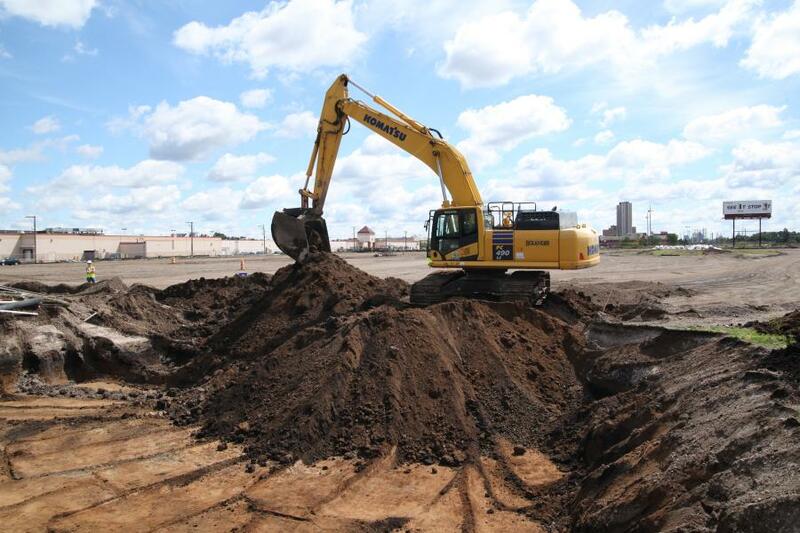 Cat dozers moved dirt as Manitowoc and Liebherr cranes rolled onto the site. A train of trucks moved in and hauled out contaminated soil. A small army of workers, peaking at 500, eventually put in an estimated 750,000 man-hours to complete the stadium. The materials that went into the stadium include 4,750 tons of structural steel, 1,900 tons of concrete reinforcing, 19,300 cu. yds. of structural concrete, a 675,000-gallon underground tank to treat runoff and 360 sports lights. Up to 330 rock anchors were placed at depths of 45 to 65 ft. Motorists passing by and pedestrians at the fence line witnessed a piece of land that for many years was a blemish to the neighborhood begin to undergo revival. Within the first six months of construction, the first steel shipment arrived. The stadium soon took shape while underground excavation and utility work continued. Behind the scenes, real estate transfer details continued to be finalized. When construction started, the key milestones that had to be met were completing the foundations, setting the steel and installing the PTFE fabric, all of which was dependent on the rights to occupy the three separate properties that made up the site. Because the first piece of property was not turned over to Mortenson until May 2017, excavation began six weeks after the original starting date on a schedule that "was driven off of standing the first piece of structural steel by Thanksgiving that year," Amundson noted. "Our first foundation element went in July 27th of that year, so we were about six to seven weeks behind schedule. We worked 10-hour days, six days a week through pretty much the first six months to get the structural concrete in to allow our structural steel to start at the southeast corner," Amundson explained. The remaining land transfer challenges complicated the construction schedule and required Mortenson to resequence the foundation, steel and precast concrete schedules so crews could work within the footprint they controlled. "Originally, the stadium was to be built from the southeast end loading dock, proceeding clockwise around the perimeter and back to the starting point," Amundson said. Instead, crews started at the south end of the property and worked through both the east and west building wings toward the north side property line, while the Midway Shopping Center property continued to move through the acquisition process. During the first construction season, the push was on to complete the mass excavation, soil remediation, concrete foundations and underground mechanical, electrical, storm and sanitary connections throughout the south section of the site. As the underground work continued, the first truckloads of structural steel arrived on site. "We met our milestone for structural steel that November and about that time the land owner had the Midway land deal finalized so we were able to exit our perimeter on the north side out to the frontage road running behind the shops on University Avenue," Amundson said. 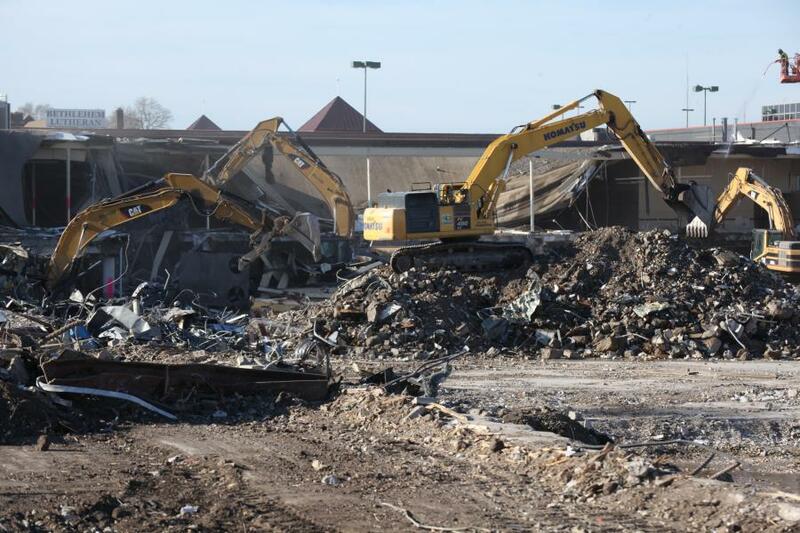 At this point, Bolander demolition crews moved in with their excavators to take down a grocery store and a bowling alley to make room for the rest of the stadium. As demolition began winding down on the first two buildings, Bolander sent another demolition crew into action to tear into a three-story building that formally housed a bank shortly after the first of the year in 2018. 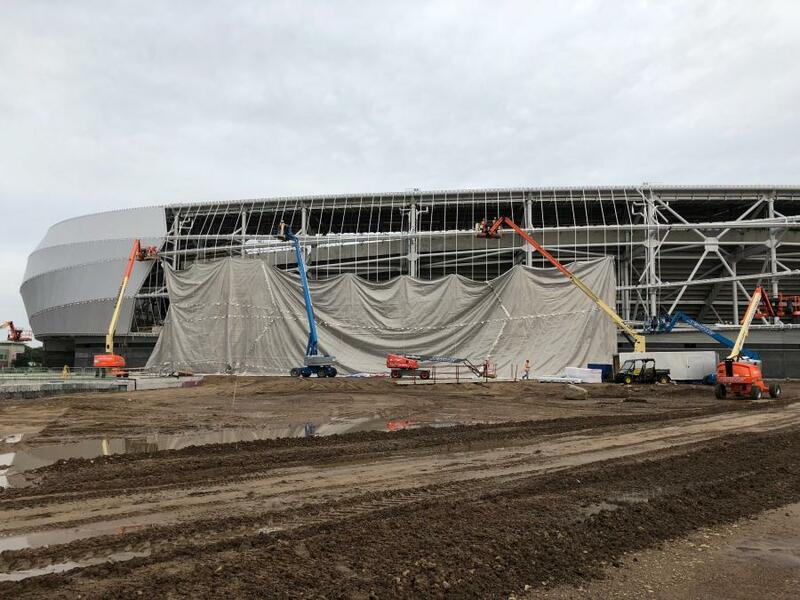 By the time spring finally arrived last year and after a mid-April blizzard brought whiteout conditions to this part of Minnesota, crews moved into the unknown to cover the side of the stadium with the PTFE fabric. The installation of the fabric was a project within a project and a laborious, international effort. It covers more than 100,000-sq.-ft. of the stadium and is made up of 10 separate panels ranging in size from 10,000 sq. ft. to over 11,000 sq. ft.
Several teams of experts were involved in placing and connecting the new fabric to the building's shell, including structural engineers, the fabric designers and third-party experts to evaluate its performance, its thermal expansion and contraction characteristics and the connection details, Amundson explained. Before the installation began, Mortenson brought the PTFE fabric installers to its equipment facility north of St. Paul to go through a trial run using a full-scale mock-up of one section of the stadium structure. It was worth the effort, Amundson said, because "we made several detailing changes that probably saved us some headaches down the road." Before installation could begin, all of the fabric was shipped in large rolls from its manufacturing plant in New Hampshire to a large textile plant in China, where textile crews stitched together the individual panels along with all of the reinforcing elements before shipping them back to the stadium site. Installation began last April and typically took place very early in the morning at sunrise to minimize the impact of wind. Each panel was laid out on the outside of the stadium and raised in place with electric winches. Just on the other side of the steel, a half-dozen installers worked from JLG lifts to guide each panel to the top. Once in place, crews made the preliminary connections on the top, sides and bottom of the panel. A typical panel was prepped on the ground and raised in one day, while the final tensioning and installation of the flashing took approximately two to four weeks, Amundson said. When it's finally hanging in place, "it is the only time you know if that panel was evaluated correctly," he said. "That's the true test — does it align with all the driver tubes, which gives it its shape? Does it align with all the connections? "There were no issues, everything fit and was able to be tensioned. That was a huge sigh of relief from all involved when you think of all the variables that went into hanging the fabric." As the fabric installation continued into early fall last year, Bolander crews knocked down the remaining building sitting on the west side of the property. Shortly after the building came down, paving crews with Thomas and Sons made it a race with winter to build a new street connection going in from Snelling Avenue to the stadium site. This work was closely coordinated with the new signal system installed along with boulevard modifications performed by city of St. Paul crews. Though crews worked through the cold, they did not have to battle snow and were able to complete this work by the first of this year as the interior work continued. On working the stadium over the last two years, Amundson summarized it up by saying, "Given all the challenges associated with the site, the unique design elements and the schedule, this is a good project to see in the rear-view mirror."